“Syria Art Exhibition – Do Fish Get Ever Seasick?” is curated by Art Space DA:MDAA located in South Korea in partnership with SYRIA.ART. Art Space DA:MDAA is devoted to representing cross-cultural arts and emerging artists worldwide. We are proud to announce that “Syria Art Exhibition – Do Fish Get Ever Seasick?” is coming soon in Seoul, South Korea. 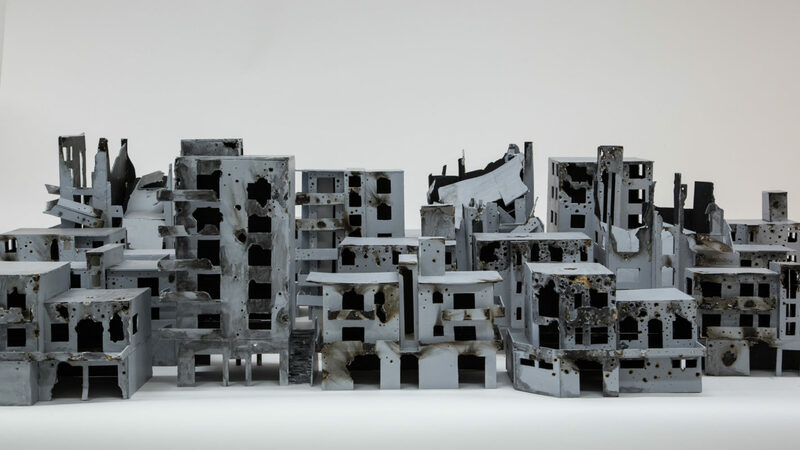 The exhibition is curated by Art Space DA:MDAA in partnership with SYRIA.ART. How Do We Define Our Sweet Home? In 3000 BC, Damascus which was the cradle of an ancient civilization influenced many other civilizations, since Hebrews, Assyrians, and Jewish people migrated through the area. This is the historical past of Syria. But what comes to mind when we think of Syria today? Is it refugees? The overcrowded boats in the Mediterranean Sea? Or perhaps, the cities that have been devastated due to bombardments? The images shown in the media create a prejudice that refugees are uncivilized and are the subject of assistance as people from the third world. But let us deflect from this narrow conception for a while. Through the living artworks of the Syrian artist I tried to change our way of thinking without having any bias. Some of the artworks in the exhibition were created while the Syrian artists migrated through numerous countries both arbitrarily and unwillingly. Rather than directly showing appalling images of war, I concentrated on two things, how the new and unfamiliar environments affected the artist’s lives, and how their art generated cultural hybridity and mixed feelings. Their work has one thing in common. Like a fish that could not adapt to the sea, which is their natural home, someone might be in a new habitat but still have trouble adapting to it. This is the kind of situation I wanted to reflect upon in relation to the Syrian artists. Interestingly, even though the artists originate from the same place, it is hard to know where they feel comfortable and what place they call their home. If homeland is defined as the place where they can comfortably stay like it was their home, then do they want to return to their homeland? How do they define themselves and where they belong to? Perhaps, we will only find the answer to these questions through the artist and their artwork. I already know that, unlike medical care centers and the aid of NGOs, art cannot save a life directly. But despite this fact, I believe that art has the power to change people’s perception of refugees and it can show how war can change a person. I focus on the view of the individual artist rather than stereotypes. The people that have struggled for a long time with changes due to migration need help with their art. We all walk down different paths, watching for the sparks that light up our dreams. The choice remains ours to choose these dreams and try to make them a reality, and it is therefore up to us to redouble our efforts, to create crossroads and to unite the forces of hope to fight ignorance and exhaust the impossible. Aware of the acceleration of time in the immensity of the world and coming from a Middle East once blessed by its diversity, I always thirst for discoveries. Traveling around the world to see everything, to better understand, to learn more about oneself, to fill the bags of memory with memories from elsewhere and to concentrate on inner silence. To face all the confusion, chaos and uncertainty of the times in which we live, and to focus on the world around with a benevolent look and an insatiable desire to fish for happiness in the waters of the present. The camera is my best travel companion, my accomplice to freeze moments in time and to eternize a vision, the ephemeral of a glance, the fragility of an instant. It is my favorite tool to share my discoveries by returning to the essential: wonderment. Learning to experience wonderment, recognizing the beauty and taste of simple things, while having a personal look that reflects a philosophy of life. So, I drew from the well of childhood and I was caught by soap bubbles. Iridescent creatures, as colorful as nature, as ephemeral as time passes and as fragile as life: I bring them with me on my travels to let them fly and settle wherever they want while playing their reflections, and while drawing as they pass by a smile on people’s faces. Instants of joy that I try to create in order to see a child’s eyes light up, those same eyes of happiness that are universal, no matter our origins, the color of our skin, the features of our face or our social status. But when the homeland bursts into tears and the sky is covered with missiles and cries, when it is no longer a question of appreciating life in all its fragments that cross us, but of surviving the bombs, when the madness of Man dominates and destroys under a deceitful pretext of religion, belief, influence or divergence of opinion, this will to fill life with wonderment and this capacity for wonderment meet their limitations in front of the absurdity of factual reality. What answer can we then give to this humanity in loss? Art is a wonderful space for revealing souls and shaping emotions. It took little time for our small team, after the war began, to understand that Art is the best response to destruction, that the omnipresent creativity of our brothers and sisters will emerge victorious from ignorance and barbarism. The brush of an artist knows how to restore colors to a jagged rainbow, to sculpt joyous faces, and from memory, to repaint a jasmine that has been torn. Thus, SYRIA.ART association was born with the mission of emphasizing beauty, drawing attention to a diverse and varied artistic creativity, and accentuating these murmurs of humanity so that they resonate stronger in the consciousness in spite of the noise of a world in full disarray. Today, through our Websites, social networks and artistic activities, we offer a cheerful arabesque, a joyful promise made of creativity and the will to exist, to survive and above all to live and share fully. With a glimmer of life in their hearts reflected in their actions and works, Syrian artists write contemporary history and its human impacts, each from his/her own perspective, drawing sadness and hope, reality and dreams. Art also serves to eliminate distance and erase differences so that the emotions of some can be reflected in the sprawling of the soul of others: it is an indefatigable traveler that knows neither borders nor visas. From this point of view, the collaboration with Art Space DA: MDAA seemed obvious: like us, they seek in Art a message of hope, like us, they seek to shine beauty in the great sun, and like us, they endeavor to see in the shadow its capacity to reveal the light. The result of this artistic connection, materialized by this exhibition, is a beautiful fragment of a hoped humanity that is part of a collective positive energy, a consequent step in intercultural exchange, one more proof that when some people destroy other ones build, and that bridges can replace walls. It is one of these paths that connects people and continents, on which we advance awakened and enlightened by the hope of a better future. We draw the traces we want to leave behind and the memory of our ephemeral presence with the most beautiful human expression.